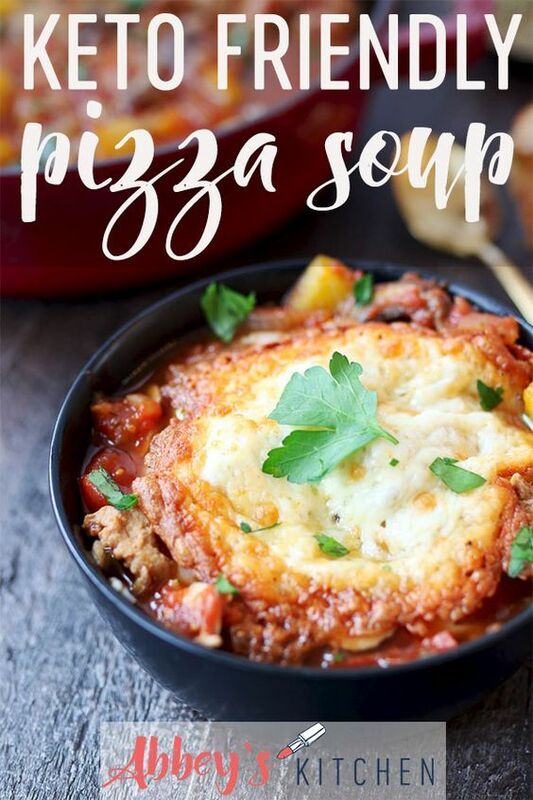 This Healthy Pizza Soup is an easy Keto friendly, gluten free, family friendly recipe that will help you get your pizza fix without the crust. To a large sauce pot, heat the olive oil over medium heat. Add the onion and garlic and stir until fragrant, about 3 minutes. Add the sausage, mushrooms, bell peppers and tomato paste, and cook for about 5 minutes. Add the tomatoes, oregano and broth and cook, uncovered, until the vegetables are tender and the sausage is cooked through, about 10 minutes. Season with salt and pepper, to taste. Transfer to a bowl and top with the grated cheese. Using a blow torch, lightly brulee the cheese. Alternatively, you can put a small handful of cheese on a baking sheet lined with a silpat and broil until bubbly and golden brown. Enjoy immediately.